Cyprus gained its independence only in exchange for the creation of three British military bases on its territory, prescribed by the 1960 Treaty of Establishment: these are the base of Akrotiri, the base of Dhekelia and the Mount Olympus radar centre on the top of the Troodos Mountains. The British Law is the only law there. The Sovereign Base Areas (SBAs) of Akrotiri and Dhekelia comprise the 99 square miles of the island of Cyprus that remained under British sovereignty when the rest of the island achieved independence in 1960. British sovereignty over the SBAs is symbolized by the Union Flag which is flown at police stations, court houses and at border crossing points. The Commander British Forces Cyprus is ex officio Administrator of the SBAs. When he carries out engagements in the latter capacity his car displays the plain Union Flag. The military command structure in the Akrotiri Sovereign Base Area once included Episkopi Garrison and RAF Akrotiri. I understand that these are now merged but there may once have been a flag and a badge for Episkopi Garrison. RAF Akrotiri has its own badge (placed within the standard template for the badges of RAF stations) and flies the RAF Ensign. Many military units within the SBAs other than Dhekelia Garrison and RAF Akrotiri fly their own flags. But the proliferation of military flags does not alter the fact that there is no discrete flag for the SBAs as a whole other than the plain Union Flag. The two Sovereign Base Areas in Cyprus are administered by the Commander British Forces on behalf of the Ministry of Defence, and not by the Foreign and Commonwealth Office. At one time the RAF Ensign was taken to be the de-facto national flag of the Sovereign Base Areas because of local political sensitivity to the use of the Union Flag in Cyprus. The British Sovereign Bases are a remnant of the British Empire and are, as their name implies, British territory, and so the Cyprus flag would only be flown as a courtesy "foreign" flag. The flag flying at the Britsh bases is the Union Jack although the RAF flag might be seen, but more rarely. At the check points only the Union Jack can be seen. New highways have been built bypassing both bases resulting in less cars using the old roads (Limassol-Paphos crossing Akrotiri and Larnaka-Ayia Napa crossing Dhekelia) and therefore the checks are now less than before. In the bases, the traffic signs and the road lines are slightly different from that of the Republic of Cyprus and the police there is the British police of the bases. The RAF Ensign is never displayed except properly mounted on a staff or mast. As an ensign, it is not permitted to be carried on a parade nor may it be used as decoration among other coloured bunting. Further, it is not correct to use it to drape a coffin at funeral, the appropriate flag for that purpose being the Union Flag. There are some occasions when the Royal Air Force Ensign has flown as other than merely the flag of the Royal Air Force, taking the temporary status of a national flag. This is demonstrated at the police border posts of the British Sovereign Base Areas on the island of Cyprus. The size of the ensign flown is usually 3 feet by 6 feet (0.91 m x 1.8 2m). On important days and on days when a formal inspection is to take place, then an ensign twice this size is flown. When the situation dictates however, such as on a high building, a much larger ensign is flown to give an enhanced aesthetic appearance. The pamphlet Notes for R.A.F. Personnel Posted to Cyprus, apparently a predecessor to the series, The Royal Air Force in Cyprus, was issued by Air Headquarters, Cyprus 1955. 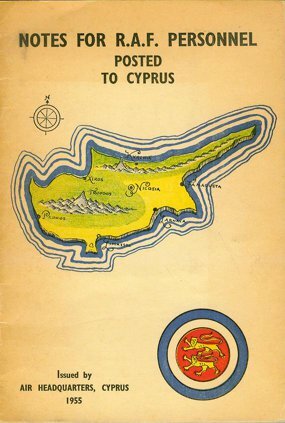 A most interesting image here is the unofficial RAF roundel on the cover (image), which has the two lions from the Cyprus colonial badge superimposed over the center red dot. It certainly is consistent with the practice of emerging Commonwealth air forces (Australia, Canada, New Zealand, South Africa & Southern Rhodesia), but of course was never authorized as a roundel for NEAF or any other RAF formation (including the SBAs). It is intriguing that this image appeared on an ostensibly official (?) publication. The Flagsonline website shows (and sells) the "Akrotiri and Dhekelia's flag". The flag is in proportion 5:7, green with two Norman leopards with black nails and tongue, taking up a rectangular area at the mid hoist as hight as half the flag's height and as wide as half the flag's width. The green flag with two golden lions is the flag of Dhekelia Garrison. There is a similar badge for the Garrison - a green shield with two golden lions. The flag and badge are purely military and like most items of this nature have been authorized at a fairly low level within the military chain of command. They certainly do not derive from a grant of Arms made by the College of Arms in London. Two red lions were the colonial flag badge of Cyprus and purportedly marked the historic associations between Cyprus and King Richard I; colonial Cyprus never received a grant of Arms. It would have been quite logical for Dhekelia Garrison to have adopted the two lions, changing the colour to gold and placing them on the green background that is traditional for the flags of Army garrisons. The King Richard School is run by the Ministry of Defence and is located within Dhekelia Garrison. Two yellow lions on green was the badge of the British Army's Cyprus District, which was responsible for the administration of the Army garrison there. I don't think that formation exists anymore, but there seems to be something called the British Army In Cyprus. My sources on British Army badges all say that the Cyprus District badge is based on the arms of Cyprus. Annex A of the new Constitution (April 2007) of the Dhekelia Sailing Club shows the various club flags.